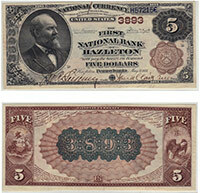 These are very rare bank notes. Only a literal handful are known to exist. It is possible that more will be discovered, but this will always be a rare note. The exact value of any example is just based on its condition and bank of issue. Contact us for more value information. Don't forget to check the serial number. Number 1 notes always sell for nice premiums.